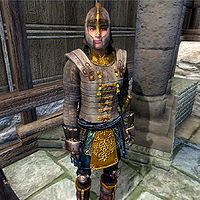 Jena is an Imperial Blade who resides at Cloud Ruler Temple in the Jerall Mountains north of Bruma. Jena is one of the three Blades entrusted with the duty of guarding the front door, which she does from 8am to 4pm. She is relieved by Caroline and then patrols the interior from 4pm to 12am. She eats dinner at the east wing from 12am to 4am and then sleeps from 4am to 8am. The only exception to this routine happens during the Weynon Priory quest, when you arrive at Cloud Ruler Temple with Jauffre and Martin. She will be one of the six blades standing in line in the courtyard, ready to lift her sword and salute her new emperor. Jena wears the usual set of Blades armor, including a cuirass, shield, boots, greaves, and gauntlets. She sleeps in a stitched green shirt and coarse linens. She wields an akaviri katana and carries a small sum of gold. Jena has a zen side to her. She says: "Sometimes when it's quiet, I walk the battlements and breathe in the cold mountain air. It's the only peace I allow myself."